Angel’s Commentary: Spammers believe that no one will notice if they only steal a little bit from every person on the Internet at once. Russel’s Admonition: Always assume that there is a measurable chance that the entity you are dealing with is a spammer. Sharp’s Corollary: Spammers attempt to re-define “spamming” as that which they do not do. Crissman’s Corollary: A spammer, when caught, blames his victims. Moore’s Corollary: Spammer’s lies are seldom questioned by mainstream media. Rule #3: Spammers are stooOOpid. Krueger’s Corollary: Spammer lies are really stupid. Pickett’s Commentary: Spammer lies are boring. Salamandir’s Rant: If I didn’t want to hear about it from the spammer, regardless of how amusing, profound, ironic, or whatever you find it, what makes you think I want to hear about it in regular email, on your blog, or verbally? In other words, if your statement starts with the words “I got this really amusing spam message…” I would rather not hear it at all. 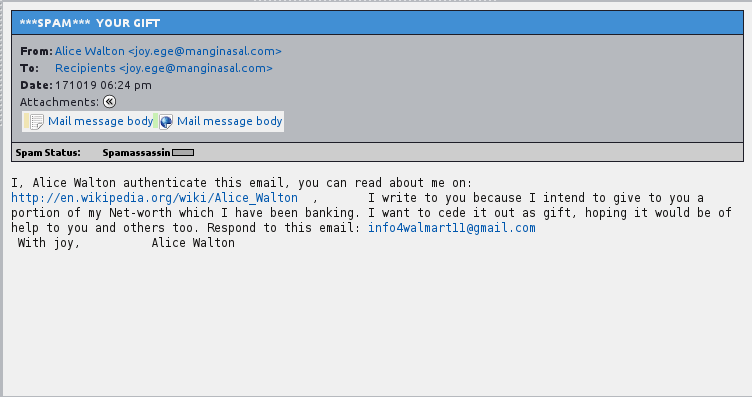 The message was sent with multipart/html formatting, meaning that it may have malicious code that executes without your being aware of it, and makes it easier for the spammer to disguise the fact that it’s actually spam. The sender’s name is different from the name indicated in the email address. The recipient is “Recipients” with the same email address as the sender. The subject is “YOUR GIFT” in all capital letters. It starts out with the affirmation that an IMPOSSIBLE person “authenticates” this email, and gives a wikipedia reference. It continues by stating that this IMPOSSIBLE person has chosen YOU to be the recipient of an allegedly unimaginably large amount of money. All you have to do is to respond to this DIFFERENT email, that isn’t either the sender’s or the recipient’s email address. And that’s just looking at the part of the email that 99.8% of recipients see all the time! Russell’s Corollary: Never underestimate the stupidity of spammers. Spinosa’s Corollary: Spammers assume everybody is more stupid than themselves. Spammer’s Standard of Discourse: Threats and intimidation trump facts and logic. Rules-Keeper Shaffer’s Refrain: Spammers routinely prove the Rules of spam are valid.